I heard a bunch of nutritionists talk about blenders in glowing terms recently, so I went out and bought a Nutribullet. 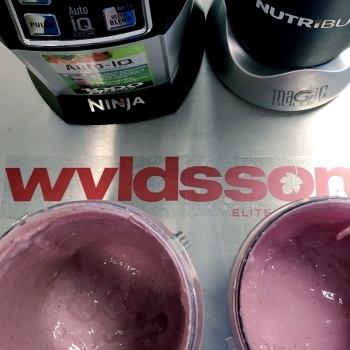 I’m impressed – it really does blend any mix of fruits, veg, nut or seed into a smoothie type consistency (I had tried using a food processor a while back, but ended up with a mushy, lumpy mess). The NutriBullet is also dead handy to clean. The blending cup goes right into the dishwasher, so there’s none of that faffing about you get with cleaning a food processor. Since I’ve been talking about my blender so much, my brother wanted to get one too and was asking me about the NutriNinja , which has been advertised very heavily on tv for the last while. Maybe it’s just a cheap knock off? I had no idea. But I was curious. So I decided to get one for him and try it out side-by-side with the gold standard NutriBullet. (I know, I know… I really should get out more!). Round 1: Fruit Smoothie This is a fairly typical smoothie, but the addition of frozen berries, nut butter and ice would certainly cause trouble for a less than splendid blender like the NutriBullet. Verdict: Both smoothies were pretty much the same – the difference wasn’t really discernible. There were still bits of seeds from the raspberries in both, although we reckoned the bits were a teeny bit smaller in the NutriNinja. Round 2: Green Smoothie This one raises the bar somewhat. 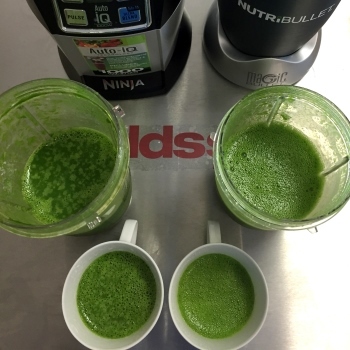 Kale is quite a fibrous vegetable, and so a blender needs to have a lot of power to break it down sufficiently. Same with the nuts and seeds. 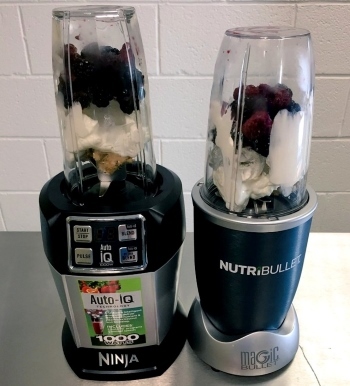 Verdict: Very little between them, although the NutriNinja mix did look a tad smoother, upon very close inspection… so we’ll just about give this round to the NutriNinja. 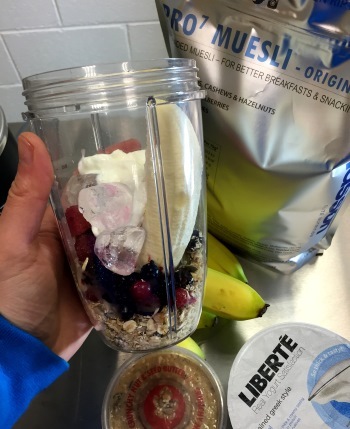 Round 3: Breakfast Smoothie Decided to throw in some muesli with the nut butter, ice cubes and frozen berries – that’s quite a lot to contend with. Verdict: Pretty much the same, although the NutriNinja mix was slightly more refined. Round 4: The Ultimate Challenge Frozen spinach is a dead handy food, but it is difficult to break down for ordinary blenders. Decided to combine this with kale and some ice cubes. 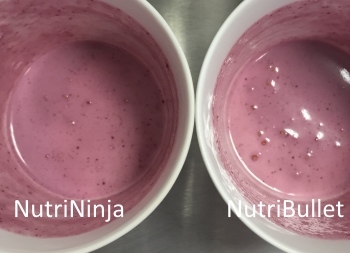 Verdict: Mix from the NutriNinja was slightly smoother, although again… it was very difficult to spot any difference. 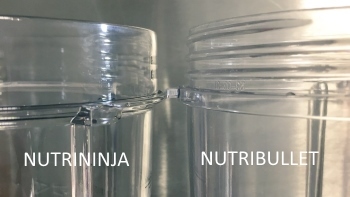 Ok, so it’s pretty clear that the NutriNinja actually is slightly better than the “gold standard” NutriBullet… but not by much. Round 5: What are the cups like to drink from? The NutriBullet cup has threads on the side, so it’s a bit like you’re drinking from a jam jar. This is kinda awkward because it can lead to drips of green smoothie on your hoodie. So NutriBullet included a “comfort lid” that you can screw over this to prevent the drips. However the NutriNinja cup doesn’t need this because it has no threads on the outside, which makes it way cleaner to drink from. Round 6: Can I take the cups with me on the go? This was another victory to NutriNinja. Their cups are slightly slimmer, which make them easier to fit into the cup holders in my car. Still not ideal, but they do fit better than the NutriBullet cups. 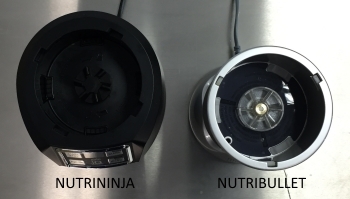 The other feature I really like is the “sipping” lid on the NutriNinja (just like a travel coffee cup). It’s essential really if you’re planning to drink your smoothie while driving. This is round is a late edition to the contest, but one that was raised by quite a few people on twitter after I published the original review… so it’s gotta be included too. 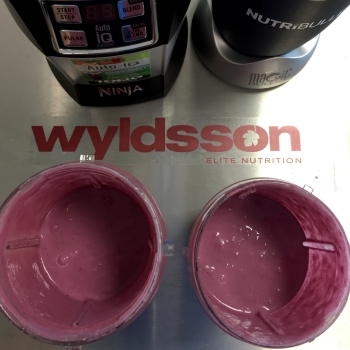 @wyldsson I’ll stick with my Bullet – the Ninja is an eyesore (yes, I am that shallow) and hence would live in a cupboard & not be used! There’s no doubt about it, the bullet is a beautiful machine, and it’s also worth noting that the footprint of the bullet is smaller than that of the ninja. This round is another late entry! 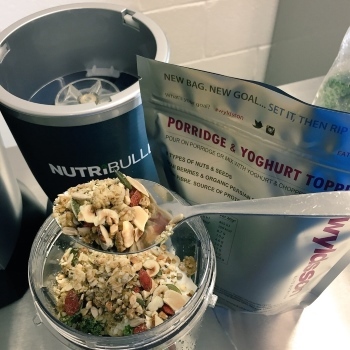 NutriBullets have been used extensively for quite a while now. The feedback is overwhelmingly good – they love them. They’re tough, strong and last. Update: After a year of use, my Ninja is beginning to sound a little rough. It’s noisy and would annoy the heck out of flatmates first thing in the morning! Verdict: I’ve never heard a complaint about a Nutribullet, and I know a lot of people who have them. 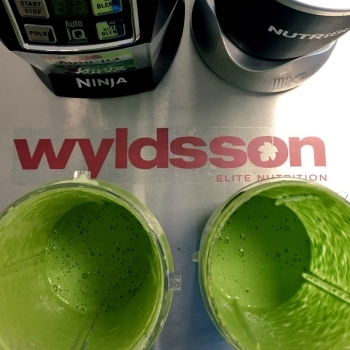 The NutriNinja is marginally better at blending and has a nicer cup. The NutriBullet is a better looking device, more compact and comes with a good reputation for reliability. Not much in it really, so I think it comes down to price… go with whichever one comes at a better price. « Is Breakfast Really the Most Important Meal of the Day?